The church is located approximately 6 miles southeast of West Chester Pennsylvania, or 3.6 miles SE of the intersection of PA 3 (West Chester Pike) and PA 352 (South Middletown Rd.) on the north side of PA 352. 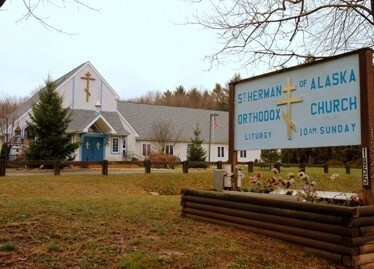 St Herman Church was founded in 1973 by a group of dedicated Orthodox Christians whose dream was to build an Orthodox house of worship in the western suburbs of Philadelphia, in Delaware County, where Orthodox of various traditions and backgrounds could worship together. The first Divine Liturgy was celebrated Sunday, September 30, 1973 by the Rev Nestor Geeza, in the Episcopal Church of the Atonement in Morton, PA, which served as a “temporary” home for the parish for the next few years. In 1977, the parish purchased its first property in Wallingford, PA. This edifice served the parish community well until 1993, when the property was sold and a new and larger parcel of land was acquired, located in Gradyville, Edgemont Township, on the border between Chester and Delaware counties, probably the fastest growing areas in the Commonwealth of Pennsylvania. On June 11, His Eminence, Archbishop Herman broke ground and celebrated the cross-planting. For the next year, the church community busied itself with planning, financing, and building our new spiritual home. The consecration of the new church took place on June 18, 1995. His Eminence, Archbishop Herman and His Eminence, Archbishop Gregory were the main celebrants. A banquet at Towne House Restaurant, Media, PA followed. The new church is styled after the architecture of our Alaskan Orthodox churches where St Herman lived and worked. The beauty of the stark white exterior and blue trimming recall the parishes in Kodiak, Ouzinkie, and Old Harbor. On November 1, 1998, the parish celebrated its twenty-fifth anniverary. His Eminence, Archbishop Herman was the main celebrant at the Hierarchical Divine Liturgy, at which the new iconostas was blessed. After the Liturgy, the newly constructed Church Memorial Hall was solemnly dedicated. A banquet was held at Desmond Great Valley Hotel in Malvern, PA. The parish continues to attract individuals from throughout the area and has greatly increased its membeship. The parish sponsors a Fall/Christmas Festival on the first weekend in November. The parish has a vibrant Sunday School with over 20 children within the parish. The church has a Memorial Hall in which we hold numerous activities monthly for the community. We have an active Charity/Missions Committee and are actively supporting a Missionary, Christine Semon, in Romania through OCMC. We also actively support the Emmaus House in New York City and the St John of Kronstadt Home in Brooklyn. Both our Church and Hall are handicapped-accessible with ramps and sidewalk.